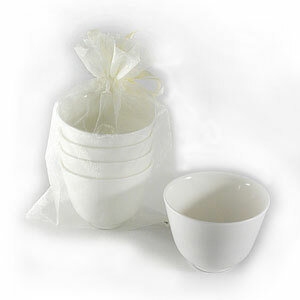 Sip your tea from our traditional fine bone china teacups. While you may want to place them on a pedestal and just admire their elegantly simple design, they can also serve up a beautiful cup of tea. If you want an authentic tea experience then these cups are the way to go. They are beautiful and very well made. I bought several sets for my book club tea tasting and it provided the perfect portion size and really accentuated the experience for us all. I highly recommend!